This is a collaboration put together by the community and myself, to help you learn about how command blocks work. This topic contains designs that you'd be able to use with your custom maps, from survival islands to mini-games. Before posting, please take into account that this is NOT a tutorial for mods, textures or third-party programs. Command Blocks can't do everything, and neither can Minecraft, so if it can't be done, that's that! Well, hope this helps you, and don't forget to leave feedback! NOTE: In some cases, you may want to do some altering of the designs shown here. Not everyone wants the player to hit a button or walk over a pressure plate. Scroll to the bottom of this post and head over to the Minecraft Wiki to find out more! Want to help? I'm currently looking for tutorials on /summon, /setblock, dataTags, and other commands and mechanisms you do not see here. Feel free to post them! /testfor ~ Tests if a player/s has a certain item, is in a certain area, or has a specific amount of Experience Orbs/Levels or Score. /clear ~ Is used to clear a players inventory, or to remove ALL of one item. /difficulty ~ Changes the difficulty to that of which is specified after the initial command. /effect ~ Adds an certain effect to a player for a specified amount of time. /enchant ~ Enchants the item the player/s is/are currently holding. /gamemode ~ Changes the player/s to the specified gamemode. /gamerule ~ Changes the gamerule specified to either true or false. /give ~ Gives a player/s a certain item. /say ~ Broadcasts the message displayed in the Command Block. Player arguements (@a,@p,@r) can beused to display a name in the broadcast. 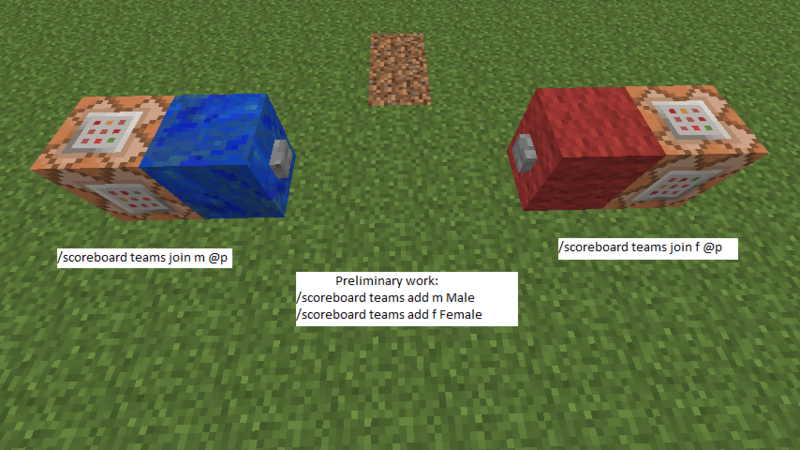 /scoreboard ~ Uses arguements from the Scoreboard. /spawnpoint ~ Sets the spawnpoint at the current location. If followed by X Y Z coordinates, this will set the player/s at a certain block. /time ~ Argument "set" (/time set) <number | day | night> . /tp @# x y z~ Teleports specified player/s to a set of X Y Z coordinates. /weather [seconds] ~ Used to change the weather, and set it's duration. /xp <amount> [playername] ~ Gives the player/s a specified number of Experience Orbs. /xp <amount>L [playername] ~ Gives the player/s a specified number of Experience Levels. according to the arguments set. 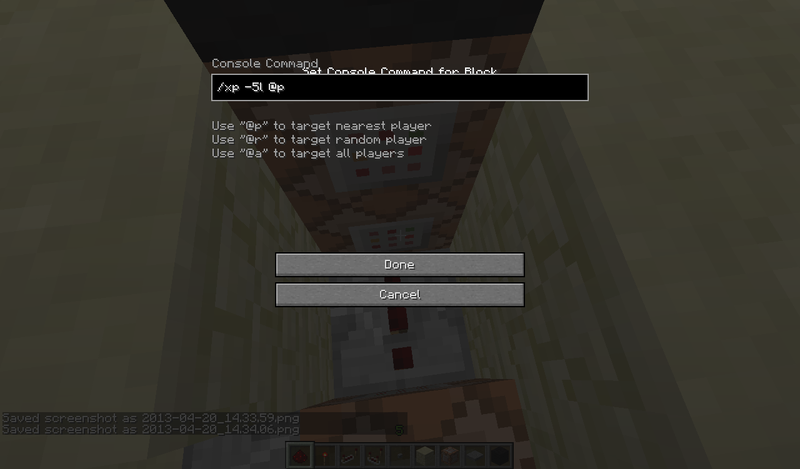 commandBlockOutput - Enables/disables text output of command block commands to console. doFireTick - Enables/disables fire spread. doMobLoot - Enables/disables mob drops. doMobSpawning - Enables/disables the spawning of mobs unless you want them to ex: eggs and mob spawners will still spawn mobs. keepInventory - Enables/disables keeping inventory on death. mobGriefing - Enables/disables creepers, ghasts, and Wither blowing up blocks, endermen picking up blocks and zombies breaking doors. Type /gamerule to change the selected game rule. list - Lists the players killcount in the (TAB) menu. sidebar - Shows the players killcount on a scoreboard on the right side of the screen. belowname - Lists the players killcount below their name label. 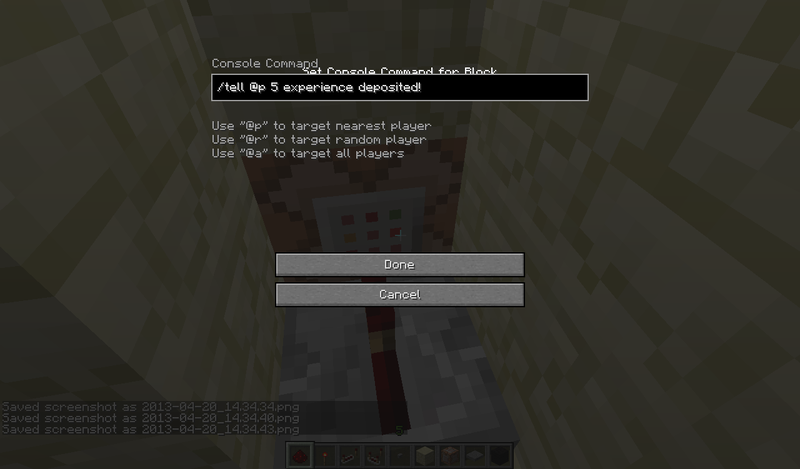 dummy - Score is only changed by commands, and not by game events such as death. This is useful for event flags, state mappings, and currencies. deathCount - Counts the number of times a player has died. playerKillCount - Counts how many PLAYER kills a player has obtained. totalKillCount - Counts the TOTAL number of kills a player has obtained. health - Counts how much health a player has left. This would cause the CLOSEST PLAYER (@p) on the BLACK TEAM (team=Black), within a 10 BLOCK RADIUS (r=10), and the ADVENTURE GAMEMODE (m=2) to be TELEPORTED (tp) to the coordinates 23 64 53. In this case, ALL PLAYERS (@a) on the BLACK TEAM (team=Black) within a 20 BLOCK RADIUS (r=20) of the coordinates 23 64 53 and in the GAMEMODE CREATIVE (m=1) would be TELEPORTED (tp) to the coordinates 32 98 13. Command Block: /say Message Here. Command Block: /tell @p Message Here. Sends the CLOSEST PLAYER (@p) a message. As you probably know, using /spawnpoint makes a wide-based spawn. Instead, use the command /spawnpoint x y z and it will pinpoint the spawn. If this doesn't work, run it through a command block on a loop. This is used for individual players, per world. You can add player variables in this manner: /spawnpoint @a x y z. This will give the CLOSEST (@p) player an IRON SWORD (267). NOTE: Item ID and player variable will change based on your map. For many versions mapmakers had to use dispensers and large amounts of redstone wiring to give a player equipment. Minecraft 1.4.2 changed everything. This will give the closest player one stone block. You don't have to target the closest player, @a will give ALL players one stone, @r will give a RANDOM player one stone. The next bit says "minecraft:stone" since a recent update you no longer have to use the numerical id's for items/blocks and it has been stated that numerical id's will not be supported in the future. For a list of items and their values, go HERE. Following that is the item count, you can make this number as large as you like. After the count is the damage value, some items aren't affected by damage values while others depend on it. Here's another /give example. This command will give you a stack of "Splash potion of Harming". Potions are one of the most common items to be associated with damage values. For a more in-depth tutorial on custom potions, go HERE. Following the damage value is where mapmakers/redstoners shine, data tags. I won't go into those too much other than give an example of what you can do with them. This will give the CLOSEST PLAYER (@p) one POTION OF FIRE RESISTANCE (8259) lasting 8 minutes. The Potion ID is 373, but the Potion DV is always different.As you can see, the ID comes first, then the quantity, then the DV. The Potion DV list can be found here on the Minecraft Wiki! The player MUST be holding the item they are going to enchant. This means selecting the first FREE slot on their equipment bar. Gives the NEAREST PLAYER (@p) an IRON SWORD (267). Enchants the item the nearest player is holding. In this case, it would give a sword Sharpness II enchantment. More on Enchantments can be found here on the Minecraft Wiki! Using Nausea as an example. This will cause the player to have NAUSEA (9) of 30 SECONDS (30). More on Potion Effects can be found here on the Minecraft Wiki! To toggle the weather between Snow, Rain and Shine, use the following command. The variables coloured in Purple are the coordinates, and will be different for everyone. This command teleports you a number of blocks away from your current location. The variables coloured in Purple indicate how far the player will travel along each axis. This command will TELEPORT (tp) the CLOSEST PLAYER (@p) 5 block along the X axis (sideways), 10 blocks along the Y axis (up/down) and 15 blocks along the Z axis (front/back). You can change the item by using a different Item ID. Google search it. This will SUBTRACT 5 EXPERIENCE LEVELS (-5L) from the nearest player, if that player has a MINIMUM (lm) of 5 EXPERIENCE LEVELS (=5). This would give the CLOSEST PLAYER (@p) 3 (3) POTIONS (373) of INSTANT HEALTH (16373). The Potion ID comes first, then the amount, then the Potion value. This can be done as a regular command. Not compatible with Bukkit servers. Note: The words coloured in Purple can be whatever you wish them to be, just make sure they are the same in both commands. Now, when you kill something, or someone, your kill count will show on a sidebar to the right side of the screen. totalKillCount - Count the TOTAL number of kills a player has obtained. Scoreboard must be activated for this to work! This will SUBTRACT 5 POINTS (remove Points 5) from the CLOSEST PLAYER (@p) if the player has a MINIMUM (score_Points_min) of 5 Points. 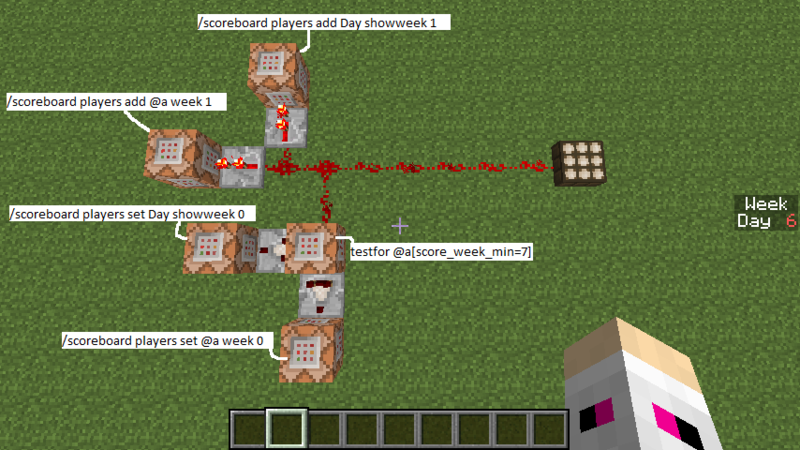 This will give the CLOSEST PLAYER (@p) an IRON SWORD (267) if the player has a MINIMUM (score_Points_min) of 5 Points. When making this, make sure you do not have any experience levels. Same goes for resetting the system. This will run a TEST (testfor) on the CLOSEST PLAYER (@p) to see if they have a MINIMUM LEVEL (lm) of 5 EXPERIENCE LEVELS. Behind this command block, place a redstone comparator. If the player tests positive (meaning the player has a minimum of 5 xp levels) the command block will output a signal to the comparator. MAKE SURE THE COMPARATOR IS NOT IN SUBTRACTION MODE. 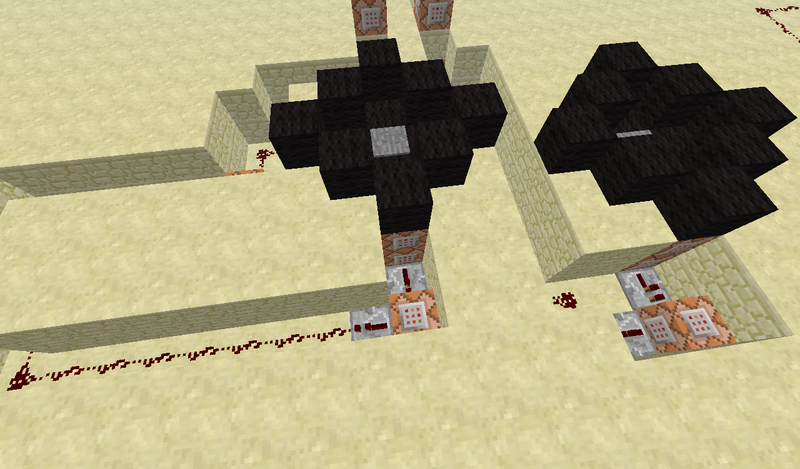 Have this comparator facing another command block. Broadcasts a message across the map telling all players that a door has been opened. This will teleport the CLOSEST PLAYER (@p) to the coordinates of your choice. I suggest teleporting the player to a block in front of the button. Also, for the door, when the player teleports to the coordinates of the pressure plate, run a wire to an inverter to switch it off. This will deactivate a redstone torch, and make the pistons retract, releasing sand. This means the door has fallen, and is open. If you don't want to use sand, you can use an Iron door and wire the pressure plate up to a T-Flip Flop, which will be wired up to the door. Coming off the same line of redstone we were first using, make a new section. This will run a TEST (testfor) to see if the player has a MAXIMUM (l) of 4 EXPERIENCE LEVELS. This means the player has 4 levels or LESS. If the player tests positive to this test, he has tested negative to the other. 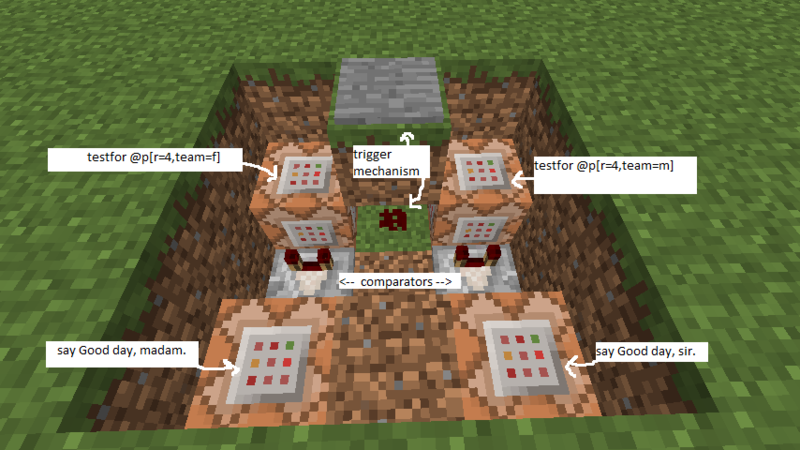 Place down a redstone comparator branching off the command block, then place another command block in front of the comparator. Have it run this message: /tell @p You do not have the required amount of funds to perform that action. If this message appears, the player needs more XP to open the door. Something I designed for a map I'm working on; thought I should share it so other people could use the same idea. If you count weeks, you could even set up Minecraft months and years! Used to store and withdraw experience levels in a Bank. Next, download the elevator. I'll post a MCEdit schematic at the bottom of this tutorial. Download the MCEdit Item Elevator "Rounds" system schematic here! You can change the scoreboard sections to whatever you like. Just remember to refer back to the Scoreboard section if you need any help! Images on imgur have mucked about, so instead of building it yourself, I am supplying you with an MCedit Schematic. Whereas  are optional, locate the sounds at .minecraft\assets\sound\, and name them after the location within the sound folder; so .minecraft\assets\sound\mob\pig\say will become mob.pig.say - it is IMPORTANT to note that numbers (0-9) CANNOT be used when referring to sound files; instead, the command will cycle through numbered files randomly (e.g. say1, say2, say3 will get picked randomly using the referrer mob.pig.say). [x] [y] [z] coords are NOT referrers for the player's position, they a the set co-ords for where the sound plays from; for example, setting this to 0 2 3 will play a sound at x0, y2, and z3. ** Denotes uncertainty, or required confirmation. This gives a basic potion (water bottle) with the count of one (that come from the '1' place after '373'). So we now have a water bottle but what if we want it to give some actual effects? To do that we have to add one more number after our count, this number is known as the 'damage' of the potion. Changing the damage of a potion will give different effects, so what happens if we give our water bottle a damage of 1? See that? We just got a basic Potion of Regeneration. We can use this damage value system to create all kinds of potions. For example, a damage of 2 will give a Potion of Swiftness etc. This is all well and good, but we don't have any "custom" potions yet. We can add custom potion effects by changing the potion's DataTag. This is achieved through the use of 'CustomPotionEffects'. CustomPotionEffects is what is telling the command that we want to add custom effect to the potion. The id is specifying what effect we want. In this case, ID 2 is Slowness. For effect ID's visit the Minecraft Wiki. The amplifier is enhancing our potion from basic Slowness I. Keep in mind that an amplifier of 0 is considered Slowness I, so an amplifier of 1 gives us Slowness II. The duration is telling our potion how long to apply the effect. IMPORTANT: Duration is measured in ticks (there a 20 ticks per second) so this potion gives a duration of 10 seconds.So when we put everything together, we get a Slowness II potion with a duration of 10 seconds. That's all well and good, but what if we want multiple effects on our potion? That's simple enough, all we have to do is add another set of data after what we had previously entered. IMPORTANT: Be sure to seperate your effects with a comma, like shown below. This potion now gives us Slowness II and Nausea for 10 seconds. But we want a more interesting name than "Potion of Slowness", to achieve this we can add a custom name to our potion using the display tag. IMPORTANT: Be sure to lay this out exactly as below, or it will not work. We can now place our custom name into our our pre-made potion as shown below. Voilà! We now have a fully custom potion with a custom name.To learn more about DataTags and how they work, head over to minihilly's post HERE. 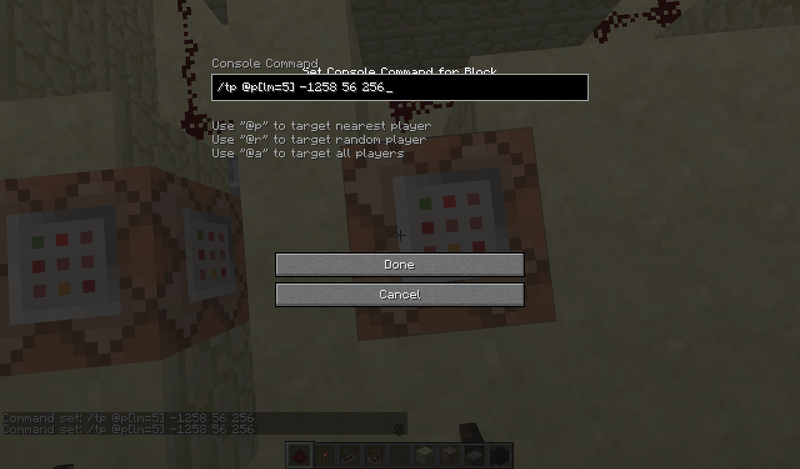 Start your command with /setblock followed by the coordinates of where the block should be placed. After the coordinates goes the alphabetical ID of the block being placed (NOTE: Future versions of mine craft will not support numerical ID's, so for a full list of alphabetical ID's, go HERE.). Following the block ID is the block data. Most blocks will have a data of 0, but some block (like wool or logs) heavily depend on data values to change their appearance. The method of which the block is placed after the data value. There are three methods available: "keep" summons the block if the space is empty, "replace" will set the specified block no matter what it formally was, and "destroy" will set the block as well as display the particles of the block being destroyed. The above will set the block above the command block to a skull with my skin on it, you can change the name to make it anyone else's. For a full list of setblock data tags, go HERE. Not too long ago, there was a time when mobs had to be summoned from dispensers of custom spawners made with MC-Edit. But that all changed with the addition with /summon in 1.7.2. Let's take a look at some code. This is the syntax for all /summon commands. Start with /summon followed by the name of the entity/mob you want to spawn E.g Pig, Sheep, PrimedTnt; for a full list of entities and their names, go HERE. After the entity's name are the coordinates of the spawn. 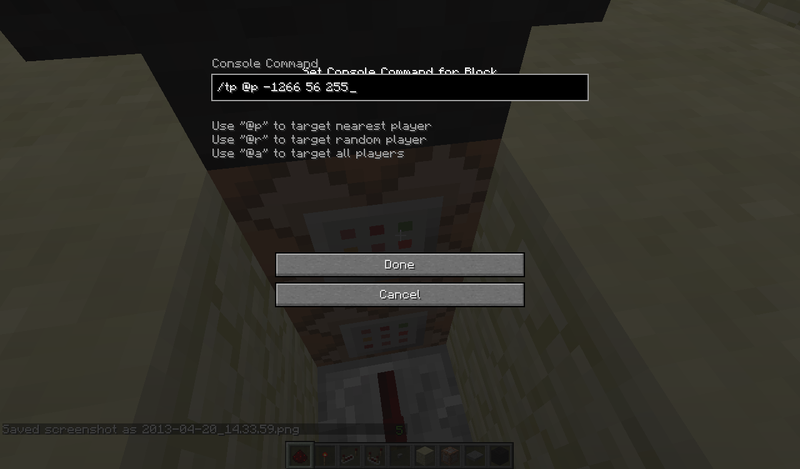 Following the coordinates is were some of the more complex command block functions come in; Data Tags. I'll be covering some of the more commonly used tags, but if you want to learn more you can go HERE orHERE. Following this is where the data tag goes. Let's give the pig a saddle. See what happened there? It is very important when using tags that you open and close each tag respectively. The Saddle tag is a boolean value, meaning it is either 1 or 0. What happens if we want the pig to have a custom name as well? NOTE: We do not have to make a new set of brackets for every tag, simply separate each tag with a comma. So there you go! Now you can use /summon to spawn entities with great ease. Before I finish, here is an example of the kind of things you can do with /summon. Feare_104 - Base Commands, Command Basics, Broadcasting, Spawnpoint, Giving Items, Giving Potions, Giving Enchanted items, Potion Effects, Teleportation to Set Coordinates, Weather, Experience Shops, Scoreboard, Point Shops, Buyable Doors, Experience Bank, "Rounds" System, the "Mystery Box" system. Benjakronk - Idea for Basic Targeting Arguments. Raecchi - Week Counter, Having NPCs speak accordingly - Gender, "Rounds" System. FlazeOfAges - Custom Potions, In-depth Giving Items, Summon and Setblock. Location: Hydrocity Zone Act 2. You forgot about relative teleportation. If you add a ~ before the number, it'll teleport that much in that direction. For example, /tp @p ~5 ~0~0 would send you 5 blocks forward on the x axis. I'll add it to the OP! AstroSpud, I have given you credit under the "Contributors" section. I think you should include targeting arguments. team=: Search for players on a specific team. m=(0, 1 or 2):	Game mode. tp @p[r=10,team=???] (put coordinates here) will teleport the nearest player on the ??? team that is within a radius of 10 blocks from the command block. gamemode 0 @a[x=23,y=64,z=53,r=20,m=!0] Will change the game mode to survival for all players within a 20 block radius of the coordinates 23 64 53, who do not already have survival. I had a thought about this this morning. Once I get home from my friends place I'll update the thread. Please reply as soon as possible. It's really bugging me :/Oh and is there a way to give an item and make it go into a specific slot?? Oh and is there a way to give an item and make it go into a specific slot?? You will probably have better luck giving custom items with droppers. What you do is create a 1x 1z 2/3y space with droppers connected to a pressure plate. Put your custom item(s) in the dropper(s), and have the command block teleport the player into the chamber, and have another one teleport the player back out. If you want items to be infinite, go into an NBT editor(I mostly use the NBT editor filter for MCedit when I do this), and change the item count value to -1. As for the making items go into a specific slot: Yes, with NBT editing you can do that. Check out Hypixel's Wither's Challenge map. The class select design is pretty much the solution to what you're looking for. Alternatively, if you want to see the design I was talking about, you can check out my map, "Conquest" here, and see how I've done it. If you like, I could provide a tutorial for some commonly needed command block contraptions, like shop designs and class select systems, with screenshots. There is no way yet to put an item into a specific slot, unless you use a different program, as Benjakronk suggested. Shops are in there. Class selection is just /clear and a heap of /give commands. It's very simple. Benjakronk added to the Contributers section.